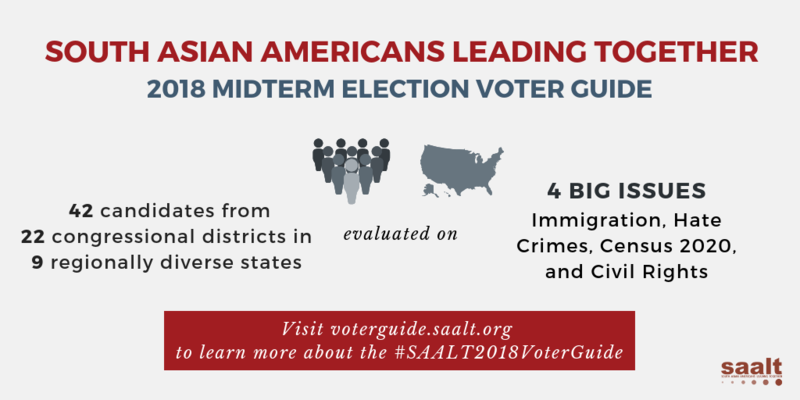 South Asian Americans Leading Together (SAALT) is excited to share our 2018 Midterm Election voter guide. 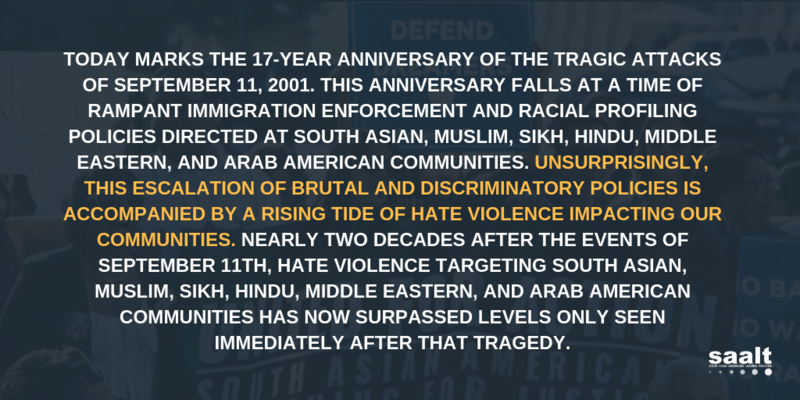 In this critical election year, South Asian Americans have a stake in key policy questions that affect our communities. An important first step is understanding candidate stances on the issues that affect our community so we can hold them accountable for their policy positions and values—regardless of their party affiliation. 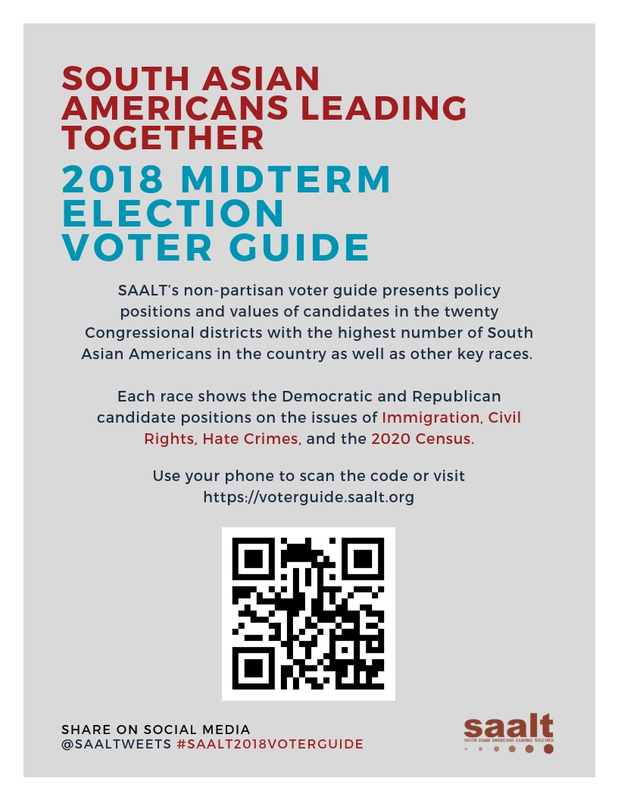 SAALT’s voter guide presents policy positions and values of candidates in the twenty Congressional districts with the highest number of South Asian Americans in the country. This guide also includes two additional races that feature a South Asian American candidate and a Congressional district whose Member holds a leadership position in the House of Representatives. Each race shows the Democratic and Republican candidate positions on the issues of Immigration, Civil Rights, Hate Crimes, and the 2020 Census based on a series of questions. If your Congressional district is not featured in this guide, we encourage you to use the questions below to evaluate the candidates in your district. Scroll down, click through, read up, and even reach out to candidates yourself before you go to the polls on November 6th! 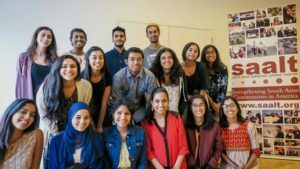 Are you mobilizing South Asian American voters for the 2018 Midterm Elections? Print and share this flyer to easily access SAALT’s non-partisan Voter Guide. 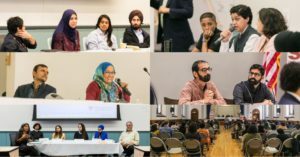 Meet the 60 members of the National Coalition of South Asian Organizations (NCSO), the nation’s largest network of community-based organizations that believe in common principles related to social change, and that provide services to, work with, convene, organize and advocate for South Asians in the United States.